To take on Xiaomi in Indian market, Micromax has launched its next generation Yu brand Cyanogen OS based smartphone, Micromax Yu Yureka in Indian market on 18th Dec. priced at Rs 8,999 will be available from mid-january in in Moonstone Grey colour option. The Pre-registration is on through online retailer Amazon from Friday(2PM), 19th Dec, 2014. 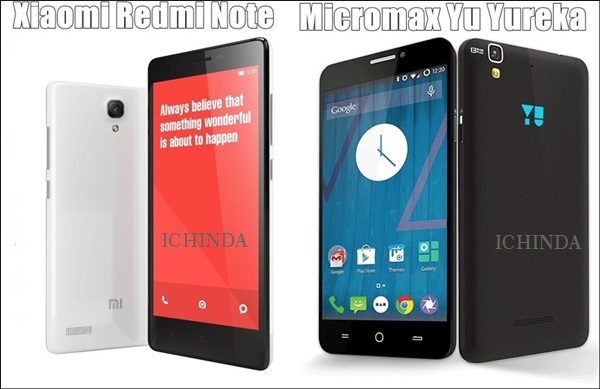 While it’s rival Xiaomi Redmi Note launched in India on 24th Nov. 2014 priced at Rs. 8,999 through online retailer Flipkart in White colour option. Both smartphone hidden tones of features, let’s check out which one is the best. While The all new Xiaomi Redmi Note supports Dual- SIM with Dual-Mode(GSM+WCDMA) offers connectivity through 3G, NFC, Wi-Fi, Bluetooth, USB and GPS comes with a bigger 5.5-inch full-HD LCD display with resolution (720×1280 pixels) and a pixel density of 441ppi and With Glass-film-film (GFF) architecture delivers stunning color consistency from almost any angle and your Games, ebooks, and videos, are vibrant, clear, and bigger than ever. Redmi Note runs on tweaked version of the Android 4.4 kitkat dubbed MIUI version 6 which is more useful, more secure, and more fun with Uncompromised depth and the powered by 1.7GHz octa-core MediaTek MTK6592 SoC Processor makes multitasking a breeze and you explore immersive game environments while 2GB RAM, 8GB internal memory and 32GB expandable memory allows you to store your favourite song, Movies and games. Redmi Note also combines 13-MP Primary rear camera with dual-LED flash, Sony’s stacked CMOS sensors(f/2.2 aperture) lets you capture more with each shot. More scenery, more friends, more of the moments while 5-MP front facing camera is perfect for video calling. It also packed with a powerful 3100mAh Li-ion battery with power management technologies promising Stand by time up to 775 hours and Talk Time up to 38 hours measure 154mm x 78.7mm x 9.45mm weight 199gm including Ambient noise reduction mic and Redmi Note Case in five colors. Redmi Note Case in five colors. At last few honest word, the all new Micromax Yu Yureka and Xiaomi Redmi Note both are best budget smartphone in India but Micromax Yu Yureka stands ahead because of 4G LTE support but Xiaomi Redmi Note minimize the gap due to 3100mAh battery. What you think? Wich is the best smartphone? Please be open to give your view. Redmi note has HD screen not full HD ..